I migrated to Instagram as my preferred social media platform not that long ago, primarily because it appeals to my creative side more than other social platforms do. But recently, as a user, I find that more and more brands are interrupting my experience with brand advertising, shoppable ads, etc. – and the ads themselves don’t necessarily align with the aesthetic I’ve come to expect from the platform. What I see from many brands instead is simply a duplication of content from their other social media streams. And while it makes sense strategically to publish consistent content across a brand’s social platforms, there are ways to do so in a way that complements each platform. In other words, brands should explore ways to take the same content they might publish on Facebook and make it more photo-centric for Instagram in an effort to inspire the storytelling it was designed to enable. 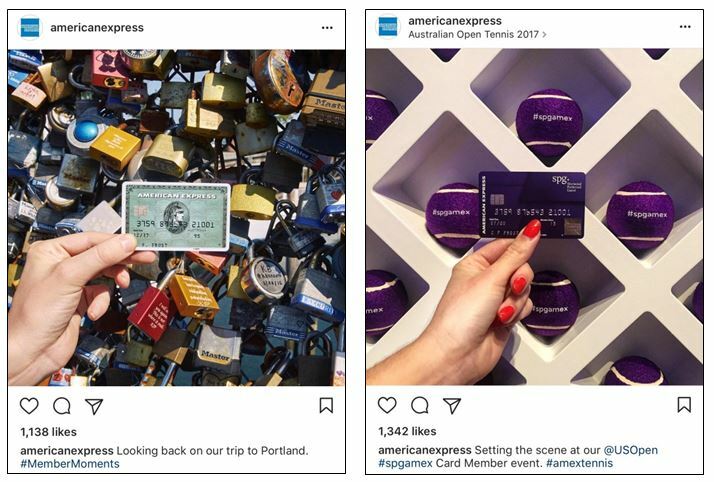 In a high-level review of financial services brands on Instagram, I found a few examples worthy of sharing as they demonstrate either 1) how FS brands publish similar content across platforms, with “tweaks” that make it work successfully on Instagram; or 2) how FS brands can use Instagram in a way that supports their value proposition, as well as the platform’s mission. 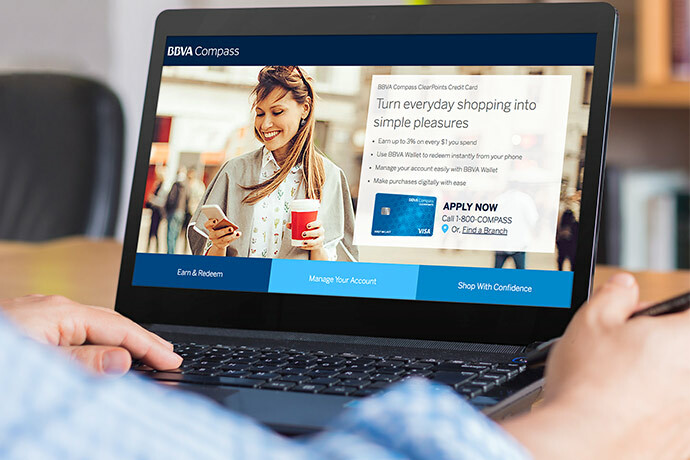 Chase uses a mix of photos and videos to promote both special events and specific card products. 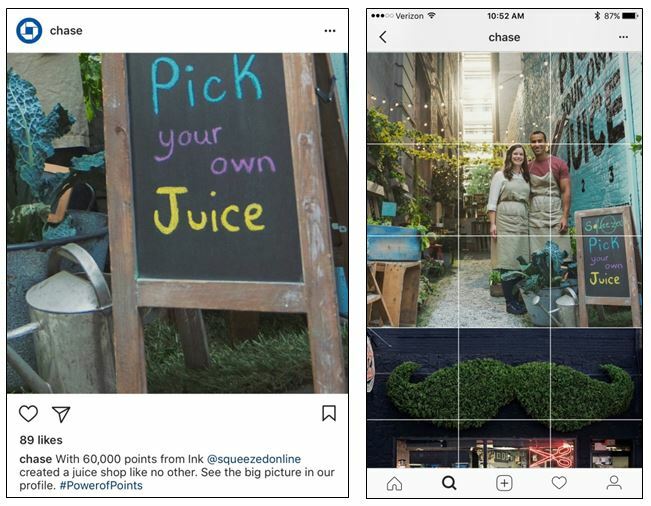 One interesting engagement device Chase deploys is using slices of photos in individual posts, then inviting users to its profile to see the full image as the brand does here with posts for its Chase Ink product. 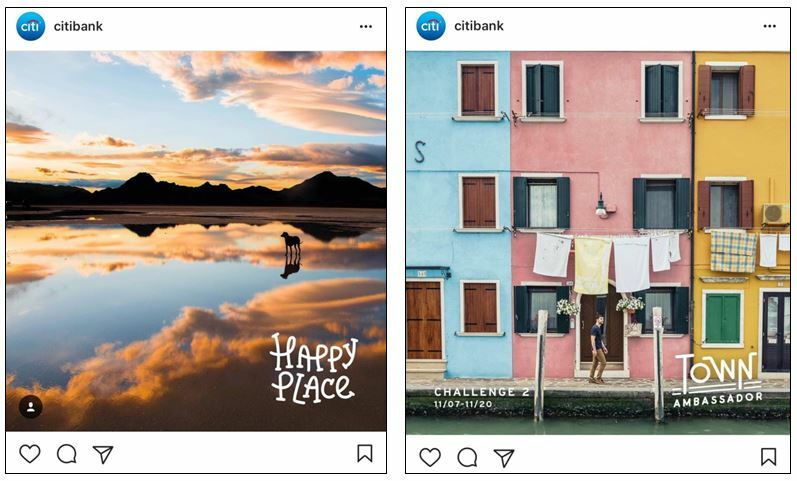 While the content is duplicative of content seen on Chase’s Facebook page, it extends the content to Instagram in a way that leverages its visual appeal. 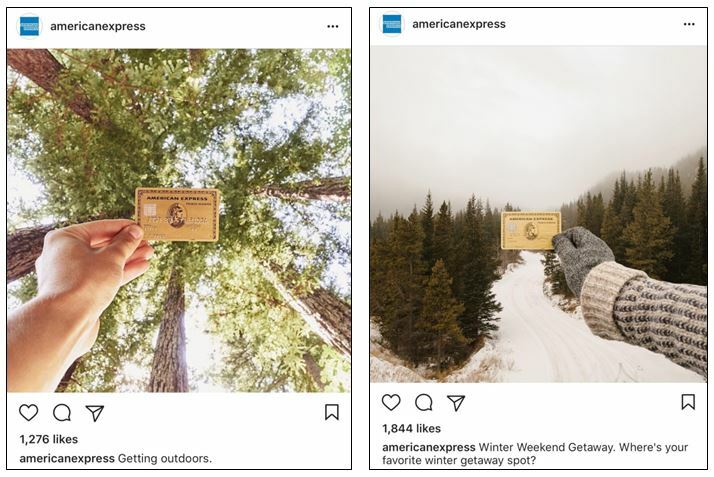 American Express also duplicates content from other social platforms on Instagram, but many of their photos have an inherent creative composition that makes them Instagram-worthy. 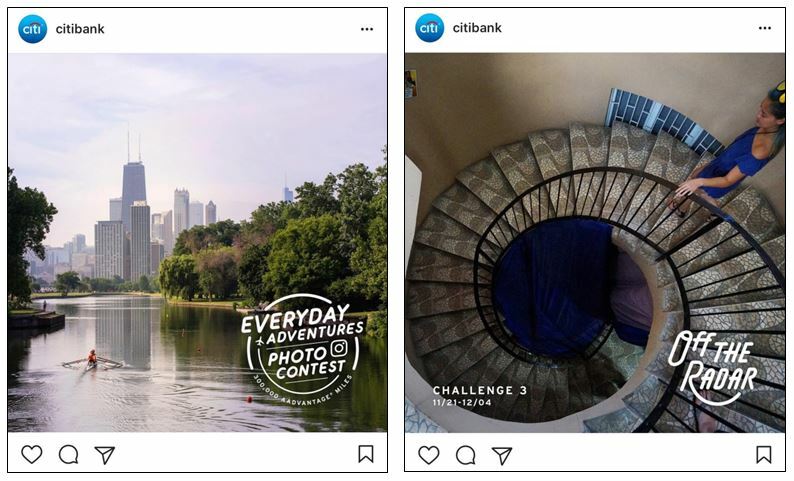 Citi and American Airlines ran an “Everyday Adventure” photo contest on Instagram asking travelers to celebrate their love of travel by showing their adventures via photos or videos related to three themes: Happy Place, Town Ambassador and Off The Radar. Participants were asked to tag their photo entries with @Citibank, #TravelOn and #Contest. The prize? 300,000 American Airlines AAdvantage miles awarded every two weeks. The net is that it is possible for brands to deliver on the experience many Instagram users are seeking. And as Instagram evolves and takes on more of Facebook’s (its parent company) features – including paid advertising, promoted posts, analytics (and possibly, some predict, algorithms that reduce organic reach) – brands will need to deliver Instagram content that resonates with users more than ever.